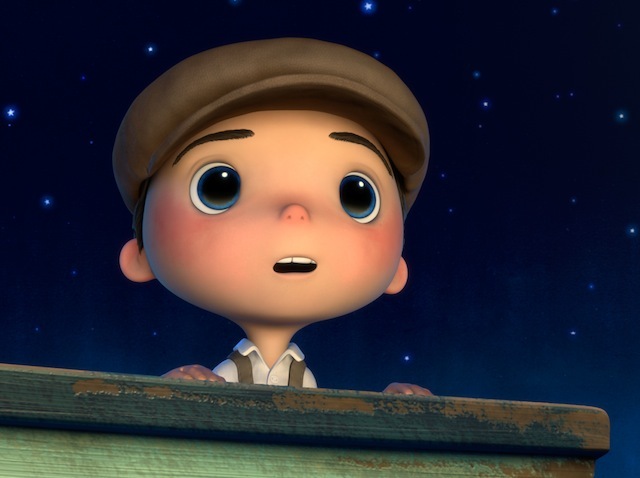 “La Luna,” the token Pixar nominee for Best Animated Short Film, is actually the slightest of the five contenders. However, it’s also a neat encapsulation of qualities they all possess: Lush visual schemes in place of linear storytelling, magical realism, and a profoundly whimsical nature. Enrico Casarosa’s dialogue-free, seven-minute odyssey follows a young boy who heads to work with his father and grandfather in the middle of a desolate ocean, where the trio set about climbing a ladder to the moon and sweeping up the glowing embers of space detritus that crash on its surface. Dominated by soothing yellows and a deliciously contorted perspective as the family scrambles along the lunar environment, the short retains its storybook appeal throughout. But it’s not even the most ambitious of the nominees to deal with shooting stars. That honor belongs to “Wild Life,” the quirky tale of an aristocratic British man who settles in Calgary in 1909. Directors Amanda Forbis and Wendy Tilby track their curious protagonist through his wordy letters home, while drawing an unlikely contrast between his fish-out-of-water adventures and the passage of a fiery comet. With its lavishly handmade, watercolor look, “Wild Life” takes on the definition of an abstract travelogue, more cogent if seen as a moving postcard than any sort of narrative experience. The same fleeting allure applies to “Dimanche,” a French-Canadian nominee about a young boy who imagines his boring life along the train tracks suddenly coming together with a series of imaginary incidents, including a live bear trapped in the wall of his home. “Dimanche” is a good-natured puzzler, but at nine minutes it comes and goes without much room to contemplate its unusual ingredients beyond admiring the purity of its 2-D line drawing style. A much sunnier look at the relationship between people and inanimate objects, “The Fantastic Flying Books of Mr. Morris Lessmore” delivers a cheerful ode to the power of the written word without including a single spoken one. After grappling with a debilitating storm, the protagonist finds himself in a cryptically sunny world where living books coax him into caring for their collective existence. Technically dazzling and heartwarming in its sincerity, “The Flying Books” is also a supremely philosophical ode a life of knowledge — and a bittersweet celebration of its fulfillment when the inevitable end arrives. WHO WILL WIN? “The Fantastic Flying Books of Mr. Morris Lessmore” seems like the most obvious contender for its sentimental value alone, but “Wild Life,” with its painstakingly rendered artwork, could be the dark horse. Editor’s note: Each year since 2005, Shorts International and Magnolia Pictures have released a program of the Oscar-nominated short films. Starting Friday, this year’s trio of programs–live action, animation and documentary–play at over 200 theaters across the United States and Canada. 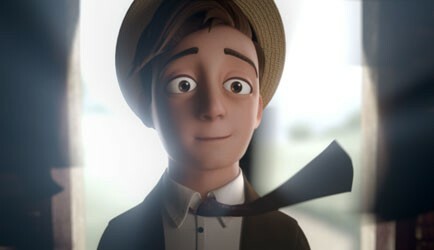 This piece follows yesterday’s coverage of the live action short nominees. Stay tuned for our take on the documentary contenders this week.